After telling you the story of my fascination with orchids and unrequited love to them, I kept thinking that there were many aspects that I haven’t touched but which would have added more proofs to how I feel about these flowers. Not that it would matter to them. In human interactions that would definitely have the opposite effect and could even be classified as stalking but I don’t expect a restraining order from these majestic flowers so let me share with you how I deal with my orchid fixation. Before I went down the proverbial rabbit hole and started stocking up on bottles, decants and samples on a SABLE scale (Stash Above and Beyond Life Expectancy ©Vanessa’s SIL), for a while I was into a costume jewelry. I liked and wore different pendants, necklaces and rings before that period and do it now, but for several years I was in the phase of the initial accumulation of costume jewelry to match things in my wardrobe. There are some one-off, rare, vintage as well as “cheap thrills” pieces in my jewelry collection, but the same way as it often happens with perfume collections, when you end up with multiple bottles from the brand you like, my jewelry box (both real and proverbial) accumulated multiple creations by artists or brands that I like. But even that cannot explain why I own not two or even three but four (!) necklaces depicting orchids. I didn’t realize it until I was writing that first orchid post. Let me show you my orchids. And, unlike their living prototypes, they never wilt on me! 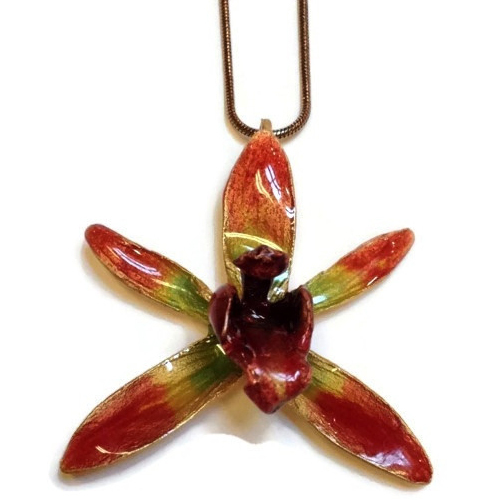 When I fell in love with Michael Michaud‘s botanical jewelry, it was mostly available from art galleries, boutiques and just a couple of online retailers. Now search returns pages and pages of sites where you can buy these beautiful creations. 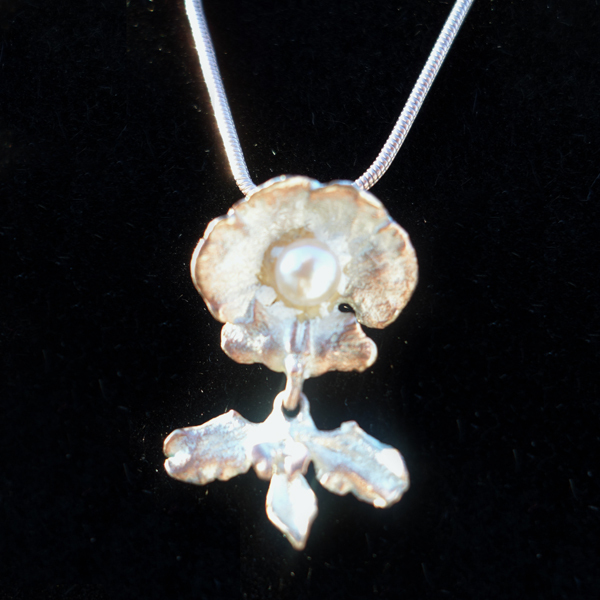 This white orchid necklace made from patinaed bronze with a pearl was one of the first pieces by the artist I bought. I can’t say that I liked it the most of what was available then (he constantly changes the range introducing new items and retiring older ones) but it was a good price… So was the second orchid necklace (bronze with hand-applied patina and enamel) that I bought last year: I saw it on eBay right before my Hawaiian vacation and just couldn’t pass. Chico’s clothing has never been my thing but for a while I was fascinated with the jewelry selection in the local store. Since then I found several Chico’s necklaces I liked and bought. They are not extremely elegant or subtle but I like them and they get me more compliments than my more sophisticated pieces (didn’t we all had similar experiences with mainstream perfumes in our collections?). 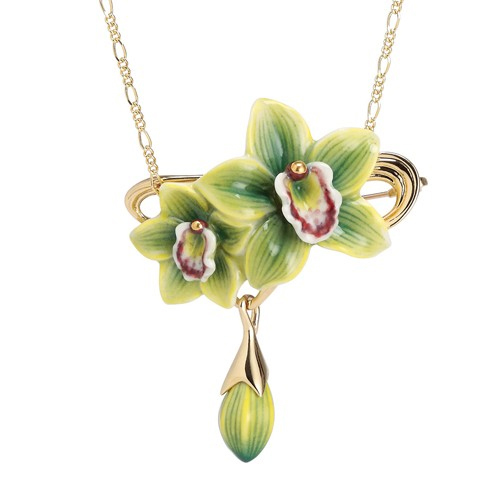 One of these necklaces just happened to be another orchid (metal with enamel). And it seems Rusty likes it as well. 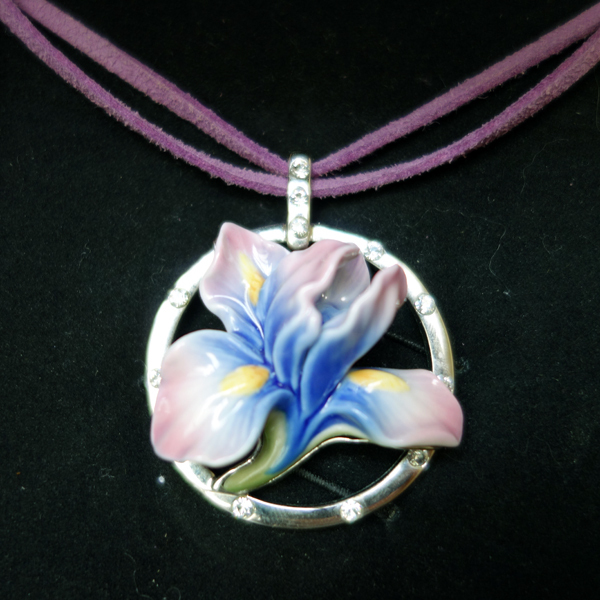 My most favorite of all orchid necklaces is the one by Franz Collection (I’ve previously features another necklace from the same brand – an iris one – in my In the Search for the Perfect Iris post). It’s made of porcelain and it looks exactly like it does on the picture below (I took a picture myself but then decided to use an official one because mine wasn’t doing the necklace justice). Finally, I’d like to play my own “LUST – MUST” game (I hope you’re familiar with the concept). 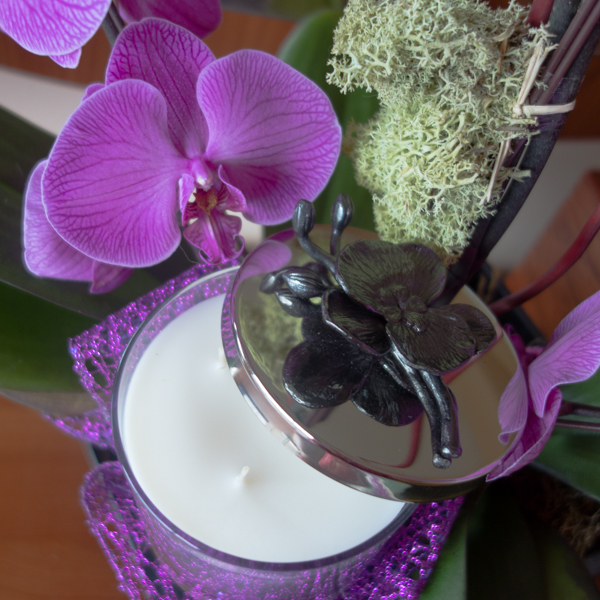 There’s a new Orchid jewelry line from my favorite designer Michael Aram. I don’t think I’ll be buying any of these but I enjoy looking at them. While Aram’s jewelry is outside of my purchasing comfort zone, his home collection is much more approachable. A couple of years ago my vSO gave me a diffuser from Aram’s Black Orchid collection as a New Year gift (I showed the picture of it in the post How Do You Take Your Amber?). And for the last New Year I got from him a candle from the same collection. I haven’t tried lighting it yet but unlit it smells nice. 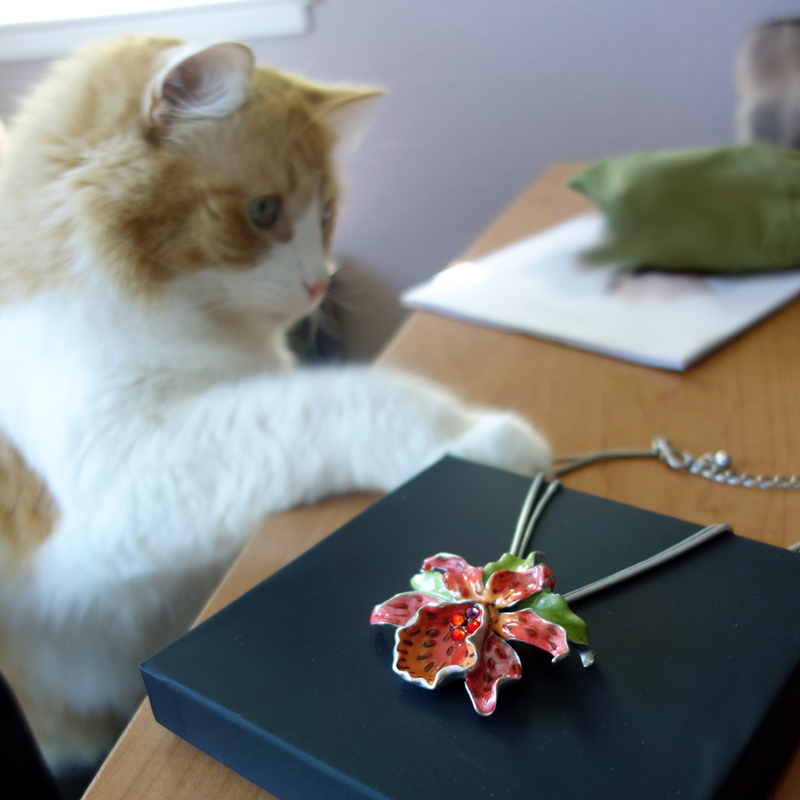 Do you own any botanical jewelry? Images: white orchid necklace, Chico’s necklace and black orchid candle are my own; the rest – official pictures. Playing with numbers for the Entertaining Statistics post about favorite flowers of Birgit’s (Olfactoria’s Travels) readers reminded me that I planned to write this post for a long time. It was half a year ago. And I haven’t got to it since then. Last week when hajusuuri shared a cute idea of this week being an iris(h) week I decided it was my cue. I like iris as a flower; it was my favorite flower before I knew it was used in perfumery (which wasn’t obvious since irises do not have a pronounced scent). 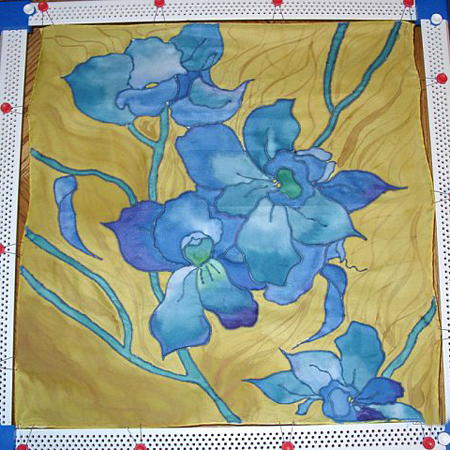 A scarf with irises (at least that was the idea, don’t judge my tracing/drawing abilities too harshly) was my first (of three) silk painting exercises. That day I was wearing my favorite iris necklace and Iris Silver Mist. At an antique shop, as I was paying for two vintage perfume minis, an owner – a woman in her sixties, I guess, – first complimented me on the necklace and asked if it was antique. I told her that it was contemporary and “made by the same designer who made those spoons” (and I pointed to one of the glass displays where a variety of Franz Collection’s porcelain spoons were presented). And she actually remembered the name without looking it up. Then, while wrapping my purchase, she also said something like: “Oh, something smells really good!” She thought it was one of the perfumes I was buying. But actually it was my Iris Silver Mist by Serge Lutens. I stepped out from the store and, laughing, told my vSO who waited for me outside about the “compliment” I got. Theoretically, I could be her mother and I can just hope that it’s her mother (who must be at least slightly older than I am) looks younger and not the other way around. But I was glad she didn’t inquire about my perfume: judging by the antique lady’s compliment it could be right up the alley of this girl’s Grandma’s tastes. I found not one but many perfect iris perfumes. Most of them are well-known, well-reviewed and well-loved so I’ll skip the usual part of giving all the details and just name those iris perfumes I enjoy the most. Infusion d’Iris EdP by Prada (have you read my story Alien wears Prada Infusion d’Iris? 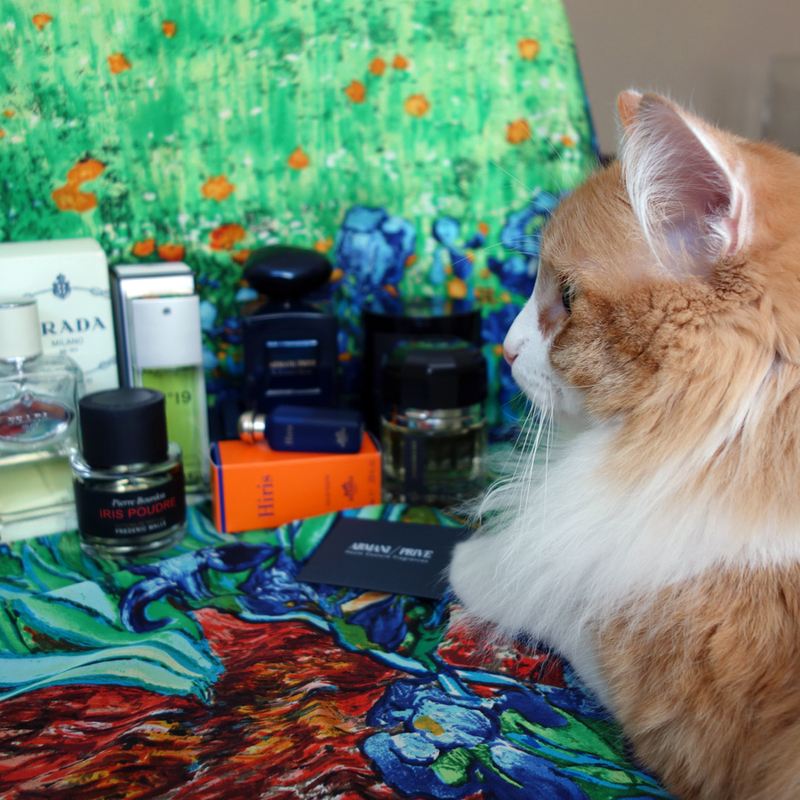 ), №19 EDT and parfum by Chanel, Iris 39 by Le Labo, Iris Poudre by Frederic Malle (it was featured in two of my Déjà vu episodes; if you’re curious take a look here), Hiris by Hermes (I want to thank again Portia of AustralianPerfumeJunkies for the mini bottle of this beautiful perfume), Orris Noir by Ormonde Jayne, Iris Silver Mist by Serge Lutens (even if you do not want to read at least take a look at the picture from Natalie’s post; that image stayed with me since I saw it and with which I always associate Iris Silver Mist now), La Femme Bleue by Armani Prive and my most recent perfume crush – Impossible Iris by Ramon Monegal (I think Rusty likes it: it was the only bottle in the group he sniffed for a while). The following perfumes I’ve tried but didn’t fall in love with: Iris Ukiyoé by Hermes, Iris & White Musk by Jo Malone, Iris & Lady Moore by Jo Malone, Iris Pallida 2007 by L’Artisan Parfumeur, Iris Ganache by Guerlain, Bois d’Iris by The Different Company, Iris Nobile by Acqua Di Parma, №19 Poudre by Chanel, 28 La Pausa by Chanel, Irisss by Xerjoff and Iris Noir by Yves Rocher. 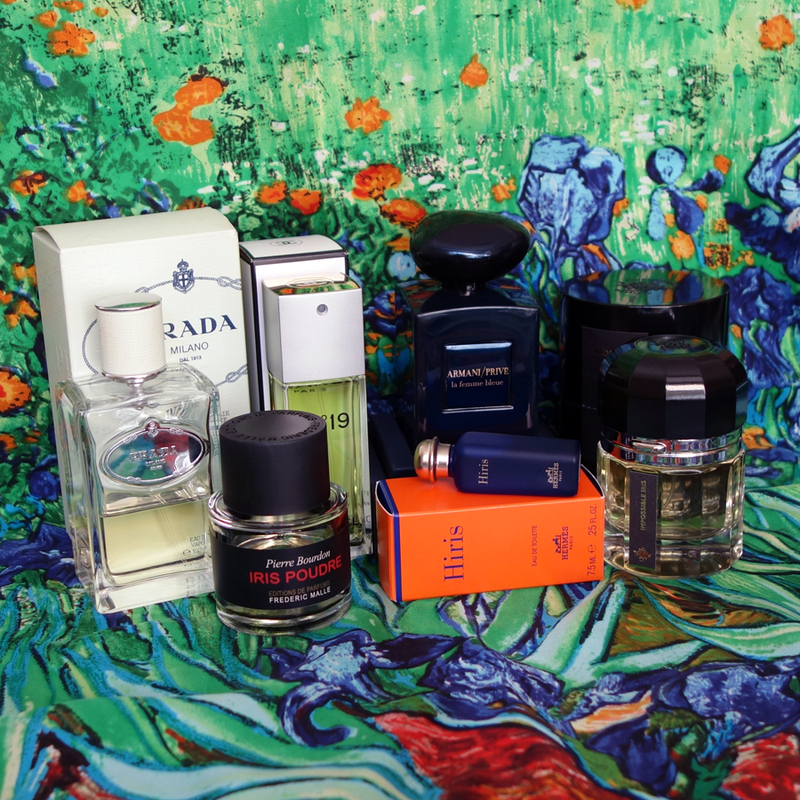 Most of them were nice and I wouldn’t mind wearing most of them (but Iris Ukiyoé – it smells unpleasant on myskin) if I happen to own them but I do not plan to pursue any bottles from the list.